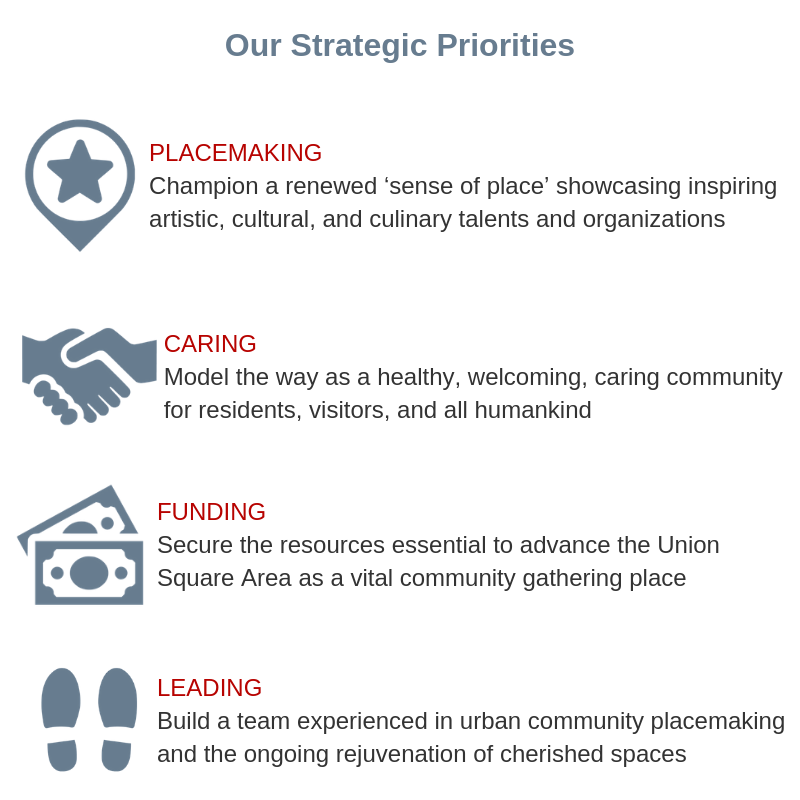 To establish a renewed ‘sense of place’ for the Union Square Area by supporting diverse artistic, cultural, and culinary programs and projects – and by cultivating a welcoming, caring community for all humankind. our government partners and district stakeholders, we are shaping the long-term vibrancy of our area with thoughtful public realm investments and homeless outreach services and workforce development opportunities. Since 1999, Property owners within the 27-block Union Square Business Improvement District (USBID) agreed to self assess themselves to enhance the quality of life for the business community, residents, workers, and visitors. The USBID provides supplemental in addition to the baseline services the City and County of San Francisco provides. These services include cleaning, safety, business advocacy. and destination marketing. To go above and beyond, the Union Square Business Improvement District formed the Union Square Foundation in July 2017, a 501C3 charitable organization to raise additional funds for public realm improvements and homeless outreach services. • Extended homeless outreach contract with Miracle Messages through July 2019. • Hosted 2nd Annual ‘Lunch on the Lane’- food trucks and entertainment along Maiden Lane during the warmer months. • Secured $75,000 for Campton Place public art and activations. • Installed flower baskets on Maiden Lane. • Installed Holiday décor & lighting.